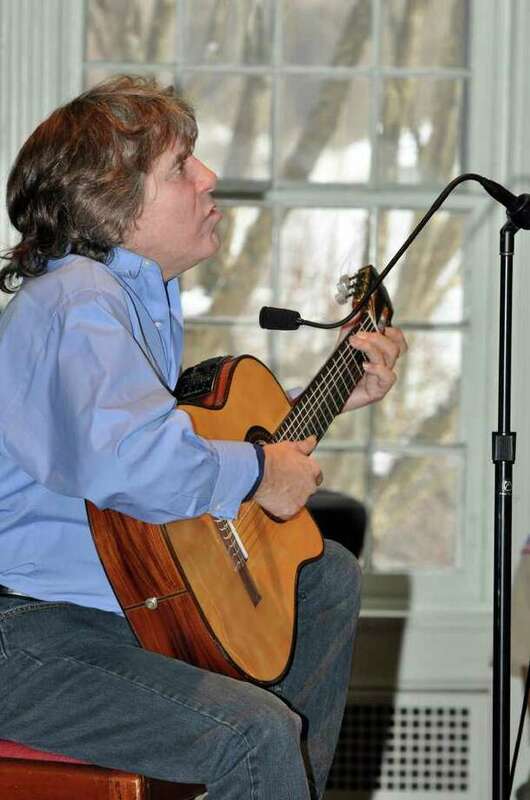 Musician Jose Feliciano performs God Bless America during the Eagle Scout Court of Honor at Saugatuck Congregational Church in Westport on Sunday, Jan. 3, 2010. Boy Scout Troop 36, led by longtime Scoutmaster Jack Berry, celebrated five new Eagle Scouts at a Court of Honor ceremony held at Saugatuck Congregational Church Sunday afternoon. Troop 36, by far, boasts more Eagle Scouts than other local troops, and a lot of credit can be given to Berry, who has been scoutmaster for more than a quarter century. His 34-year-old son is long gone from the troop yet Berry has stayed on, remaining a mentor and a role model. Darcy Sledge, mother of Eagle Scout Chris Sledge, has a theory on why Berry has stayed on so long. "A teacher sees a student for a snapshot of a year's time," she said. "A Little League coach may work with a boy for several years, but eventually hands the youngster off to the varsity coach." But a troop leader, she said, is in a unique position. "He works with boys on a consistent basis, from the time they are [typically 11] years old, all the way through age 18. He is in a position to influence a young man's journey from boyhood into manhood. He sees them in different circumstances -- working on a badge in a meeting, working to stay warm and dry in a leaky tent. Over time, he transforms them from followers to leaders. I imagine it is a very empowering, yet humbling experience." Berry told the Westport News that he's had so many wonderful experiences with young men, turning around kids in trouble, or seeing them achieve goals they never thought they could reach. He has seen boys who are introverted, or who have low self-esteem, become outgoing and confident in the course of a year sometimes, or during a session of summer camp. "You work with kids like that, you give them jobs to do, let them feel their own success," said Berry. "There's nothing more meaningful for a kid than to feel their own success." Success can be as simple as conquering a high ropes course when they are terrified going up. When the child gets picked up by his parents at the end of camp, he's ecstatic, telling his parents, "I did it, I did it," said Berry. Berry takes the scouts everywhere, from Boston, Baltimore and Washington, D.C., to as far away as Scotland, Poland, Iceland and Switzerland. The scouts go on an international trip every other year. In 2008 one of the scouts was selected to go to Japan as part of an exchange program. Scotland is the country they visit most, however. It is there where they participate in The Scottish Patrol Jamborette, where they mingle with hundreds of scouts from 15 countries. After Troop 36 spends about a week together, the boys go their separate ways and stay in different parts of Scotland with host families that have a young adult involved in scouting. The overseas trips, said Berry, promotes international relations and help the American scouts learn about other people's cultures as well as similarities between people of different nations. It's a tremendous amount of extra work, said Berry, but it is worth it. Members of Troop 36 most recently traveled to Scotland in 2008. The cost for each scout was only $1,800 for three-and-a-half weeks. Berry said the scouting experiences, and the 12 points of Scout Law, help the boys to not only be honest, honorable and truthful, but also to act properly in emergencies. He noted one of his scouts, a 16-year-old, was driving down Greens Farms Road when he saw a man and woman had flipped off a motorcycle. The woman's head had hit the curb. "This scout went over, triaged the situation and started treating the woman with a gash on her head," said Berry. "The boy took off his shirt and used to stem the flow of blood. He also used his jacket as a headrest and employed a log to prop her feet up "because she was going into shock." Arriving medical personnel was impressed and the doctor at the emergency room credited the teen with saving her life, said Berry. Another time, another scout went into action when his father slid under his lawn mower. Instead of panicking or waiting for an ambulance to arrive, the scout "immediately started tying off all the wounds to the bottom part of his father's legs." Berry has perhaps more Eagle Scouts than other troops because he encourages boys to stay on when they feel like dropping out. If they have other things they do that may conflict with a Boy Scout meeting, Berry finds ways to work around it. "I have to adapt to the modern world," he said. He often brings a guest to a meeting -- usually a former Scout who has achieved success in some form, like a West Point graduate or a successful investment banker. Berry may be the troop's scoutmaster but he tries to get the scouts to plan and run the meetings, and organize camping trips, to understand and deal with responsibility. The scouts of Troop 36 learn many life lessons, but if nothing else, said Berry, "they learn how to be independent, make decisions, learn a moral code and learn what their physical and mental limits are, what they can and cannot do." Jared Mittleman, who earned Eagle Scout in 1997 before heading off to college, eventually returned to Troop 36 as an assistant scoutmaster as a way of giving back. Mittleman came up in scouting under Berry and said he is one of the "most incredible mentors I've ever had the privilege to know and I thank any scout that's had the opportunity to have him as scoutmaster has had a real gift in life." He added, "I think what drives him is the same thing that drives me, which is the opportunity to see these boys develop. It is amazing to see the differences that develop between a boy who walks in at 12 and the man who leaves at 18, and I think Jack is motivated by that." John Durkin, father of Eagle Scout Jeffrey Durkin, spoke highly of Berry. "I think I can say with certainty that Jeff and a lot of other boys like him would not have stayed with scouting had it not been for Jack. He really has been an inspiration," Durkin said. "His whole style is to let them run the troop. He provides guidance but he lets them mistakes and learn from them." Durkin said Troop 36 has better retention rates than other troops. Sledge told the Westport News: "We joined this troop because of Jack. We only knew of him by reputation." She said Berry truly enjoys watching the scouts grow and turn into responsible young men. In the case of her son, scouting has opened all kinds of doors for him in terms of leadership opportunities, personal growth and being a productive citizen. The five scouts honored Sunday for attaining Eagle were Chris Sledge, 17; Jeffrey Durkin, 17; Francesco Zaffina, 18; Jason Wiles, 18; and James Kammert, 17. More than half of Troop 36's 100 Eagle Scouts came under Berry's watch -- 61 to be exact. Berry has been scoutmaster since 1988. The troop has been around since 1948. Numbers don't lie. Berry is truly a local legend.